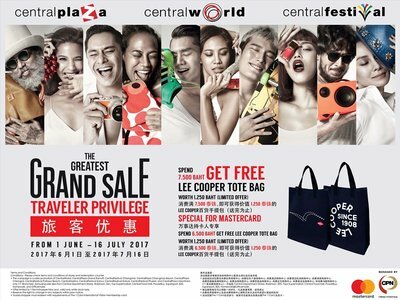 Central Group or CG, one of the largest commercial conglomerates holding companies in Thailand and leader in the local retail sector, together with its subsidiaries and business partners launches ‘The Greatest Grand Sale 2017‘ campaign to help promote the country as the foremost shopping and dining destination for tourists around the world during the mid-year season. The group has invested around US$ 11.7 million in promotion activities, aiming for both local shoppers and foreign tourists in all age groups. It is offering customers discounts of up to 80 per cent, between June 1 and – July 16, 2017 at 66 branches of Central shopping centers nationwide including CentralWorld in Bangkok, CentralPlaza and CentralFestival in major cities such as Phuket, Chiang Mai, Pattaya, Samui, as well as shopping via Central Online. Dr. Nattakit said that for Thailand, the economy is expected to stay on the uptrend in the third quarter this year, driven by government spending, rising domestic consumption and exports while the number of foreign arrivals will grow thanks to the TAT campaign. Bangkok has recently been ranked the best city for street food while Thailand is a hub for a wide range of local and international cuisines. Internationally known as a land of arts and culture, delicious foods and exotic fruits, as well as a value for money destination among travellers, the kingdom has an edge over its rivals in the region. Adding to the attractions, Central Group also hosts the following events: ‘Thailand Amazing Durian & Fruit Festival’ at CentralFestival Chiang Mai (June 7-13), Central Phuket (June 28 – July 4), ‘Amazing Thai Taste’ at 11 branches of Central Pattana (June 1 – August 15), International Chaiya Boxing at CentralPlaza Suratthani (6-11 June), Bangkok Floating Market (a big pop-up floating market to showcase Thai river culture in the past) at CentralWorld (June 29- July 30), among others. The tourism industry has predicted a surge in Chinese and Russian tourists between June and July, given the geopolitical tension in the Korean peninsula. The period is usually a peak season for Chinese tourists, further brightening the prospects of the retail business and the tourism sector in Thailand. CentralWorld, the group’s flagship mall in Bangkok, expects locals to make up 70 per cent of its overall customers during the mid-year sale period while the Central store on Samui Island predicts a 60:40 split of local and foreign shoppers as well as a 30 per cent increase in both sales and customer traffics. The Central Group, with 66 branches nationwide and over 10,000 product brands, will offer its customers up to 80% in discounts on fashion and lifestyle items, spending in restaurants, home appliances, sports equipment, stationary and office supplies etc during the campaign. Central shopping centres have now established a reputation as a “Centre of life” and a ‘Destination for All’. Also, the company is currently implementing the ‘Generation Marketing’ strategy aimed at people in all age groups based on a variety of products and services offered by the group. It hopes to enhance the shopping experience via promotions, quality products and reasonable prices. Come and visit Thailand! Shop and dine till you drop at all Central shopping centres located in major tourist destinations across the country – Bangkok, Phuket, Chiang Mai, Hatyai, Pattaya, Udonthani, Khon Kaen, operating under the names of CentralWorld, CentralPlaza, CentralFestival, Central Department Store, Zen, Robinson, etc. The Central Group believes that the campaign will make tourists enjoy shopping here and register Thailand as the global destination for shopping in Asia.